Those awaiting results of July 2014 Real Estate Appraisers board exam may find here the complete list of passers, top 10 (topnotchers), top performing and performance of schools as the Professional Regulation Commission (PRC) and the Board of Real Estate Service released results in 3 working days after the exam. PRC on Thursday announced that 696 out of 1,620 passed the Real Estate Appraiser Licensure Examination. The results of examination with respect to one hundred forty (140) examinees were withheld, per Board Res. No. 52 dated July 11, 2014. The Real estate appraiser board exam was given in Manila, Baguio, Cagayan de Oro, Cebu, Davao, Iloilo and Lucena on Sunday, July 13, 2014. The members of the Board of Real Estate Service are Dr. Eduardo G. Ong, Chairman; Ramon C. F. Cuervo III, Florencio C. Diño II and Rafael M. Fajardo, Members. Real Estate Appraisers board exam covers the following subjects: Fundamentals of Real Estate Appraisal (50%) and Professional Appraisal Practice (50%). 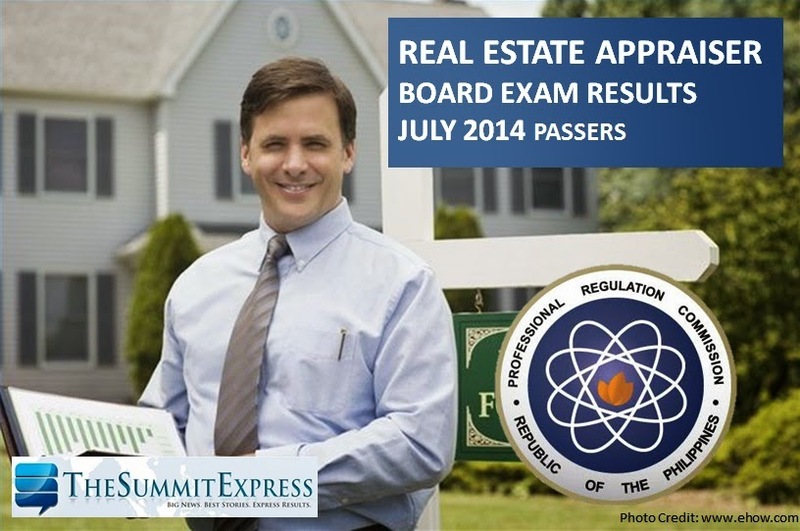 Follow Us on Twitter or Like Us on Facebook to receive updates for July 2014 Real Estate Appraiser Board Exam.